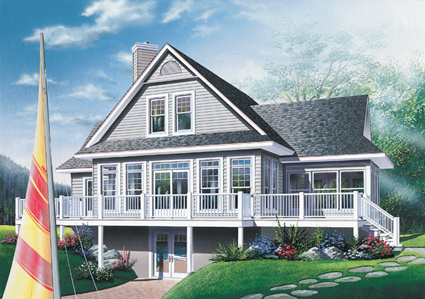 This vacation/recreation house plan combines old-fashioned charm with up-to-date functionality and design. The handsome rear facade features welcoming double doors to the main level, with side stairs leading to a spacious open porch and wall of windows.. Enter on the main level to 9-foot ceilings and flowing open interiors that seamlessly lead to entertainment areas for sitting and lounging, dining, and preparing food. The master bedroom suite features walk-in closet and luxurious bath. Two additional bedrooms on the upper level share a full bath. The splendid screened porch is not included in the living square footage.